Have you been thinking about learning a new language but haven’t been able to find the time? 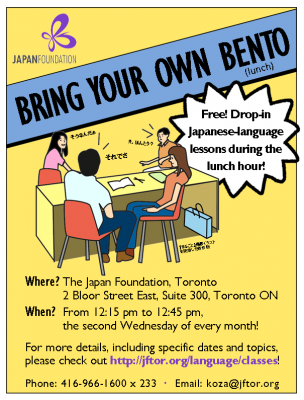 The Japan Foundation, Toronto is happy to offer a monthly drop-in starter Japanese-language lesson series over the lunch hour! In these lessons, we will introduce helpful words and expressions to get you started on the path to communicating in Japanese! 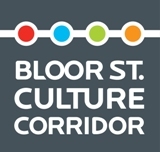 So if you are in the Yonge/Bloor area, why not stop by and sample the Japan Foundation’s approach to teaching the Japanese language? And these lessons are B.Y.O.B. (“bring your own bento“), so please feel free to bring your lunch with you! Lessons are held the second Wednesday of every month at 12:15 pm, and run for approximately 30 minutes. … with more to come! Registration is not required, but space is limited so please feel free to let us know you will be joining us using the form below! If you have any questions, please contact us at koza@jftor.org!